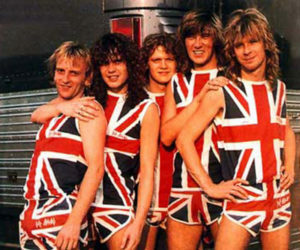 Def Leppard release album number 3. Pyromania. This album was love at first listen. See the bottom of My Life in Music Part 1. Listen closely and you will hear the importance of backing vocals. All five members were recorded for them. Pete Willis, guitar, was fired from the the band in the middle of recording. Willis was a key player on Pyromania. The guitarist co-wrote four of the album’s 10 tracks, including Photograph. Willis also played the rhythm guitar parts on every track. Phil Collen (friend of Joe’s) joined the band for the final stages of recording. Collen played solos on five of the tracks, with Steve Clark taking the other five. In the UK Pyromania was selling slow. It peaked at No.18. Their European tour drew disappointingly small audiences. Joe called it “The Nobody Cares Tour”. The lead single “Photograph” gets them on MTV, where they fit right in. “Rock of Ages,” “Foolin” and “Too Late for Love” follow, and Def Leppard launches their first headlining tour of the US. Over 10 million copies sold. Def Leppard follow up four years later with their album Hysteria, which is even more successful. Let’s chat about “Rock of Ages” shall we? ”Gunter Glieben Glauten Globen”. What does that mean? The answer is it doesn’t mean anything. The band sometimes jokingly claims it means “running through the forest silently”. It’s actually just German-sounding gibberish. Mutt Lange was a perfectionist and would often do dozens & dozens of takes. Getting bored with the standard count, “One, two, three, four” he simply started saying nonsense words. The band liked it so much that they included it on the album. “Rock of Ages” quoted in the 1986 movie Highlander by Kurgan (who is also the voice of Mr Crabs). The album is a sophisticated transition for Def Leppard. Going from British heavy metal to a more radio-friendly sounding Metal Pop. Pyromania lead me to “High N Dry”. I bought it. Loved that one, which in turn lead me to “On Through The Night”. I wasn’t as high on that one. There were a few songs I really liked but nothing like “High N Dry”. You could see it. You could feel it. You could definitely hear it. There were glimpses. There was potential. There was a gleam and a glimmer of what was possible. The jump from “On Through” to “High” was huge. It was also the first time Def Leppard worked with Lange. The jump from “High” to “Pyro” was ginormous.